As mother tries to coax them to sleep, two white children, presumably brother and sister, lie together in a shared bed, listening to the wind whipping around them and asking question after question about what they hear. In response to the children’s quandaries, the unseen mother offers whimsical reasons for the wind’s powerful sounds. The pages alternate between the unsettled children tossing and turning in near darkness and colorful depictions of the children’s interpretations of the mother’s explanations. These spreads each include four words that correspond to the images. Sometimes the words rhyme or use alliteration (“away day”; “rocking rolling”), but there is no consistent pattern. The placement of most of the text on one spread and a sprinkle of words on the next could make this book useful for established readers to share aloud with beginners; however, the faint color and scriptlike display type unfortunately render some words hard to read. The illustrations succeed at conveying a sense of the wind blowing but do not stand out as particularly compelling. 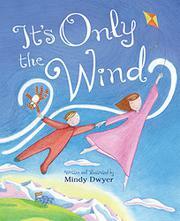 The children’s hair, clothing, and even their facial expressions are stiff in contrast to the movement of the wind. The overall effect is that the book feels somewhat dated. It concludes with a one-page list of facts about wind.